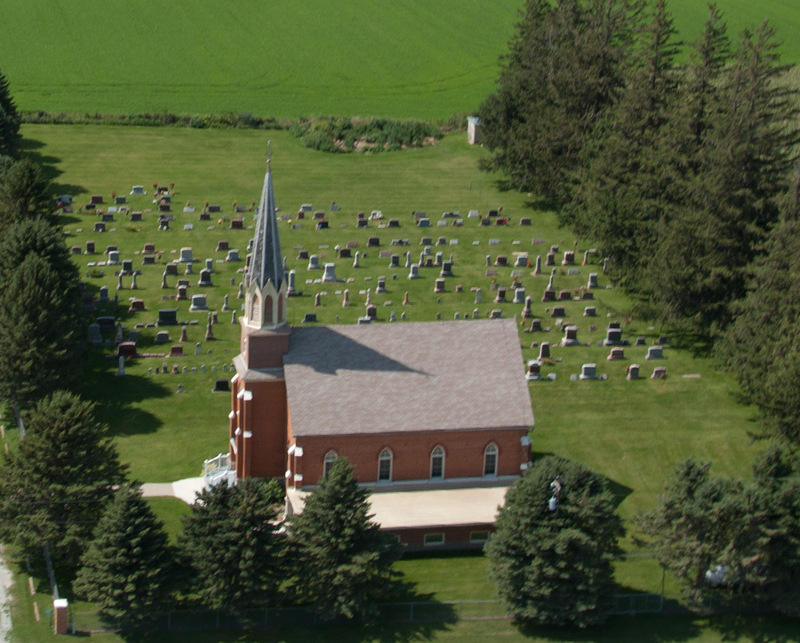 ORGANIZATION: The Garness Trinity Lutheran Church cemetery is oriented with the cardinal points of the compass and comprised of two sections; Section A to the east and Section B to the west. Each section is organized as a grid with numbered rows. Section A includes rows 1 through 11 numbered from east to west. Section B currently reflects rows 1 through 6 numbered east to west. Each row is further subdivided into plots with plots numbered 1 through 37 from south to north. DATA: This cemetery database, created between May and July 2008, is a composite of data from three sources. 1) Garness Trinity cemetery plot records define the basic structure of the cemetery. 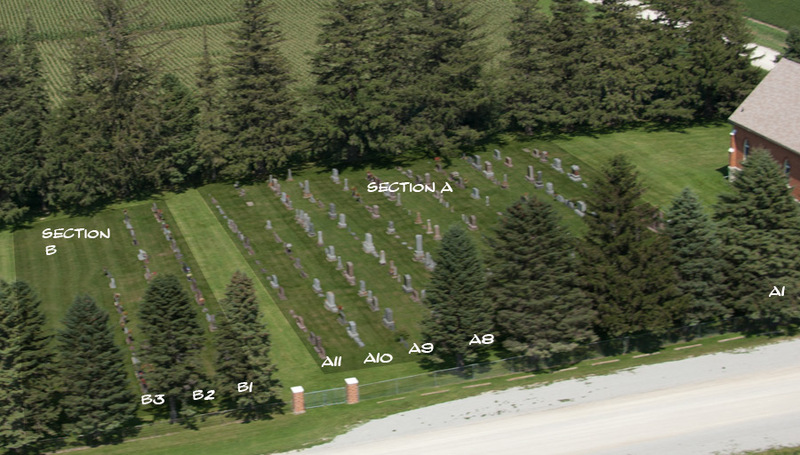 2) Data from existing grave markers is superimposed on this plot map with each marker assigned a lineal number. Finally, 3) cemetery data records from the Fountain, MN Historical Society were used to fill in missing and/or illegible records. Whenever conflicting data was found the presence of a grave marker and legible data on existing markers was given precedence over all other records. DISCREPANCIES: As might be expected in an older cemetery, discrepancies exist among the various data sources. Extant memories relate that sometime in the past a number of older, broken markers were re-erected by a contracted service. The records from Fountain, MN include notations to the effect that death dates, and possibly other information at the bottom of the stones was lost when the remaining marker fragments were re-erected and set in concrete. The location and manner of re-erecting older markers also strongly suggests that accurate plot records either did not exist or were of no value in accurately relocating the oldest damaged markers. Multiple interrments in a single plot constitute another source of apparent discrepancy between existing markers and plot records. Marker information indicates that many of the multiple interrments invlove children who were lost at an early age and interred with a parent or other beloved relative. CONDITION: Stone used for markers in this cemetery is a mixture of limestone and granite. The older markers were almost exclusively made of limestone. Due to the inherent qualities of limestone, many markers that were legible when the Fountain, MN Historic Society documented the cemetery in 1986 can no longer be read. In these cases the Fountain records were used as source data. Where markers were still legible, the inscriptions on these stones were given precedence over the few transcription errors identified in Fountain records. As might be expected, a few of the oldest markers were not fully legible in 1986. No attempt has been made to supply such information from sources other than those previously identified. GENEALOGY: Finally, local sources including published genealogical materials suggest that several of the marker names from preceding generations are either wrong or misspelled. Since the purpose of this documentation is to accurately record the Garness cemetery as it exists in 2008, the inherent accuracy of these stone records has not been challenged. To view the name and stones in alphabetical order, click here.